Description: NS 19K rolls west on the Huntington District toward Peru. Description: A closer veiw of 19K on the NS Wabash Line. Description: NS 19K arrives Peru in this late Monday Morning. Description: NS 19K creeps forward toward Benton St. and will be setting some cars out before getting recrewed here. Description: NS 19K moves slowly toward Benton St. on this Sunny Monday Morning. 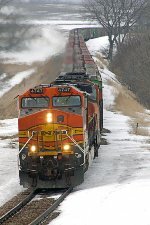 Title: BNSF C44-9W 4747 is a trailing unit on this eastbound. Description: A southbound manifest streaks past Picnic Park. 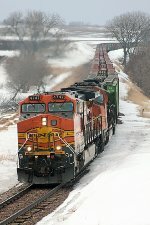 Title: BNSF 4747,BNSF's St.Croix Sub. Description: Trailing on the rear of an eastbound manifest as the train's DPU's.